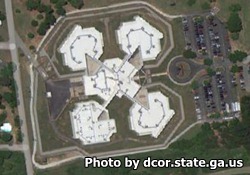 Clayton County Correctional Institution is located in Lovejoy Georgia, part of Clayton county. This facility houses approximately 242 adult males who have been convicted of felonies. It is a medium security institution that holds the inmates in an open dormitory setting. Inmates at this facility can participate in work detail that includes supervised crews within the parks and recreation department, refuse and landfill, water authority, and custodial positions with various government agencies. The Chaplains office offers religious studies, a choir and worship/prayer services. Inmates can also earn a GED, and learn new vocational skills such as automotive repair, water treatment plant operator, building maintenance and landscaping. The visiting hours for this correctional facility are currently unknown, please contact the institution at the telephone number provided for more information. If you know the visiting hours for this facility please help us and others out by leaving a comment below.